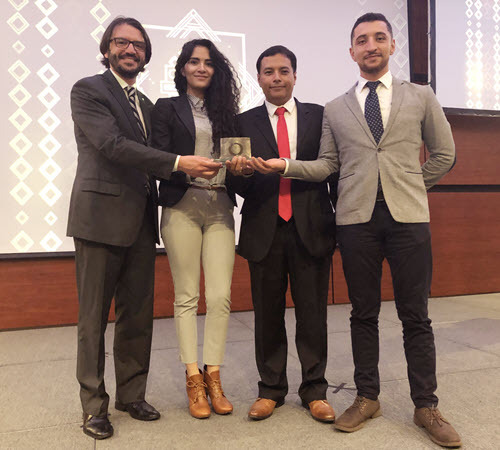 OCENSA, one of the largest oil transportation companies in Colombia, awarded the ROSEN Group with a prize in the category Transformation and Innovation. Every year, the Colombian corporation organizes the event to highlight and recognize the valuable contributions of its contractors and contract managers who distinguish themselves by their achievements, developments and improvements in their contractual relationship with the company. This year, the other award categories were Connected to the Environment, Efficiency, Responsible Management and the Regional Category. “Thank you very much for this important recognition in innovation. We are a company dedicated to innovation and this service is unique worldwide, the first of its kind,” said Leonardo Mendoza Sanchez, Director of Business Execution South America, when he accepted the prize on behalf of ROSEN. “I’d like to thank our team and also the colleagues from OCENSA,” he added, thanking OCENSA’s employees involved in the collaboration and Enrique Sandoval, the company’s president. Over the past year, ROSEN has provided an inspection service to the pipeline operator of a 42” subsea pipeline at the Conveñas coast. The pipeline presented a number of challenges, preventing an inspection using traditional methods. Therefore, a tailored solution was developed including high-resolution MFL-A ULTRA (Magnetic Flux Leakage) technology in a bidirectional configuration — a solution that had never before been applied in this way. Members of ROSEN South America (northern region) project team: Jonnathan Perez (Sales Manager), Kathy Diaz (HSE Coordinator), Leonardo Mendoza (Director of Business Execution) and Carlos Cruz (Project Manager). The unique solution successfully inspected the so-called “unpiggable” pipeline, providing the operator with valuable data on the integrity of the asset to help enable its safe future operation.